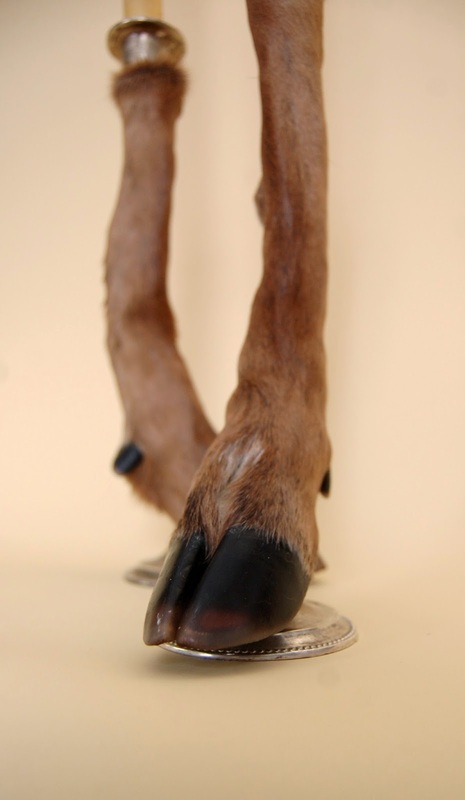 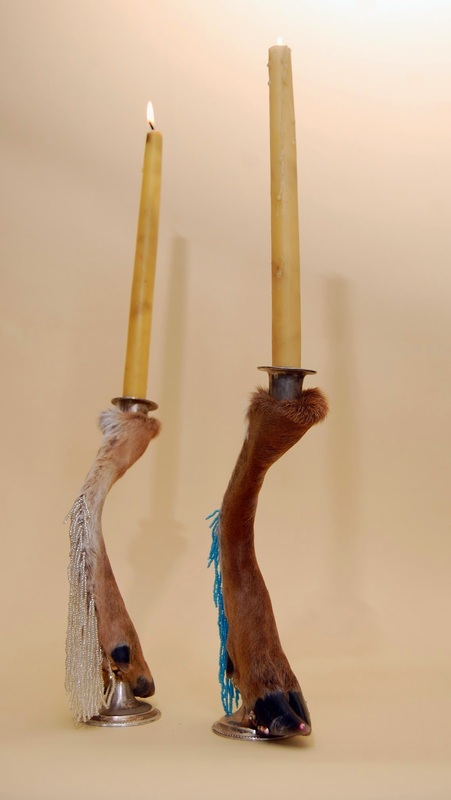 Here we have a pair of deer hoof candle holders that were commissioned by a client who basically told me to do whatever I wanted. 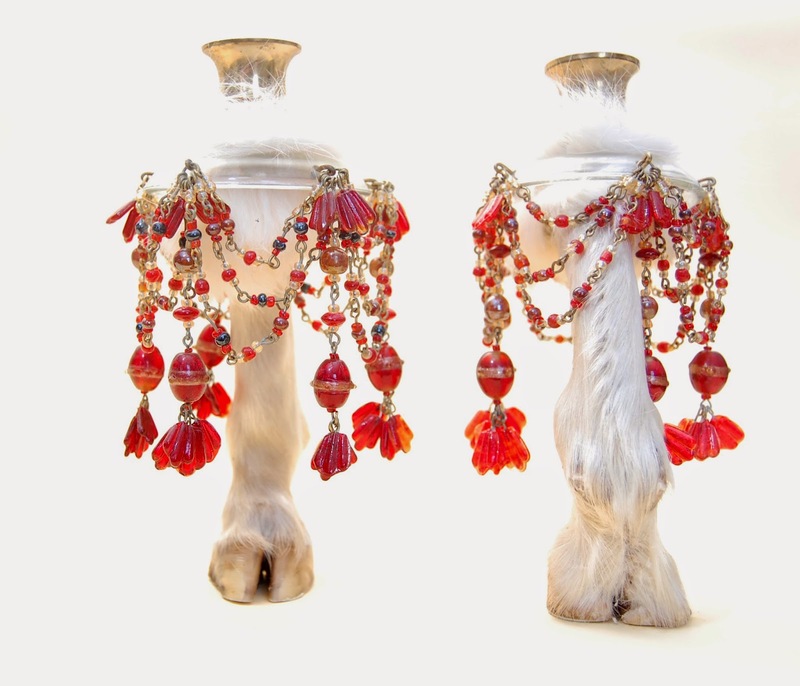 She knew I was going in a kind of psychedelic direction with them when she contacted me after seeing a work in progress shot on my Instagram feed and put a down payment on them. 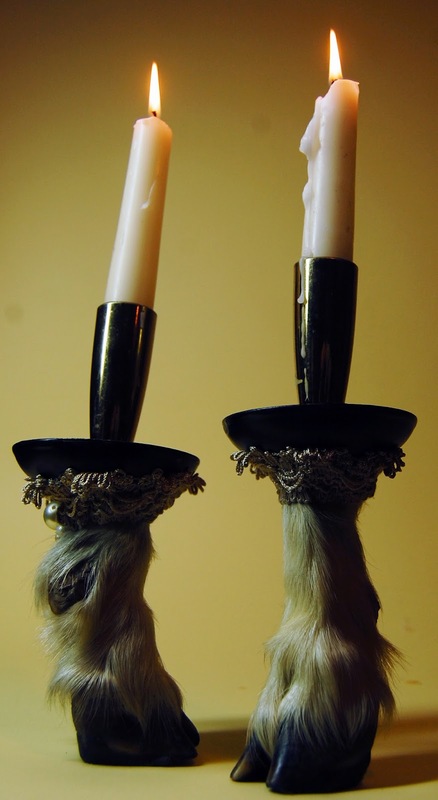 She received them today and is beyond pleased, which pleases me tremendously. 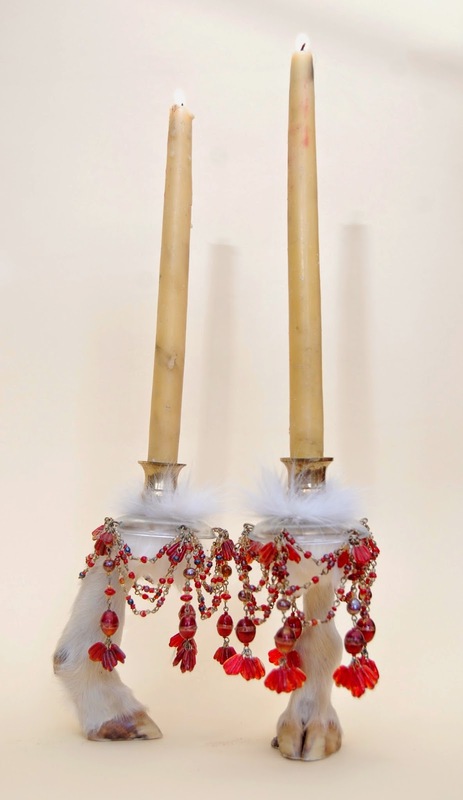 I used a pair of antique silver bases and cups, and hand beaded the fringe myself. 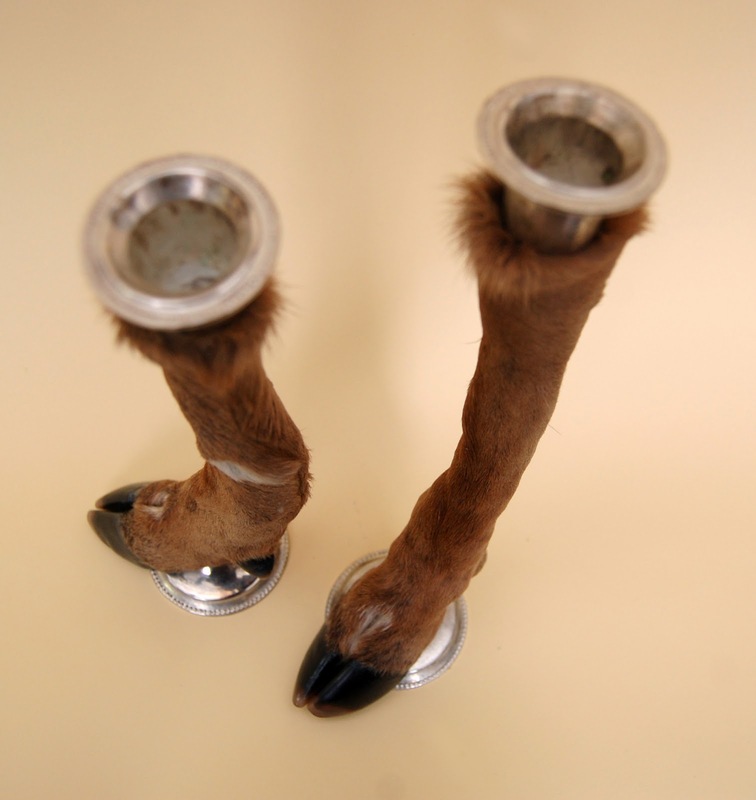 It took hours. 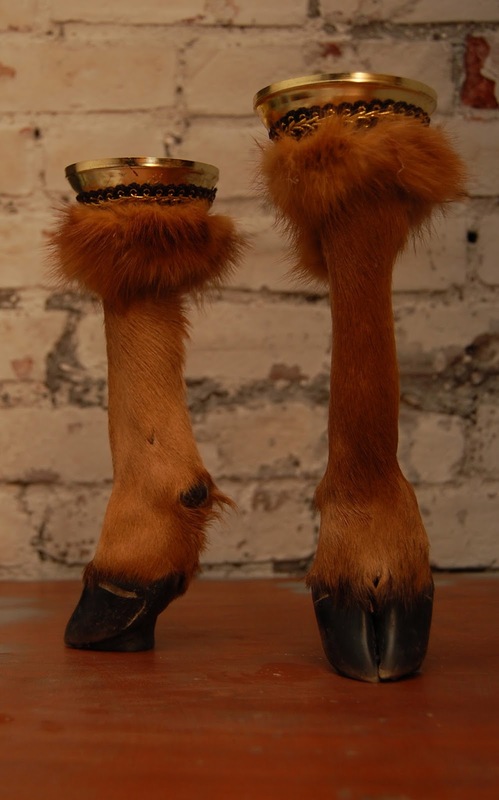 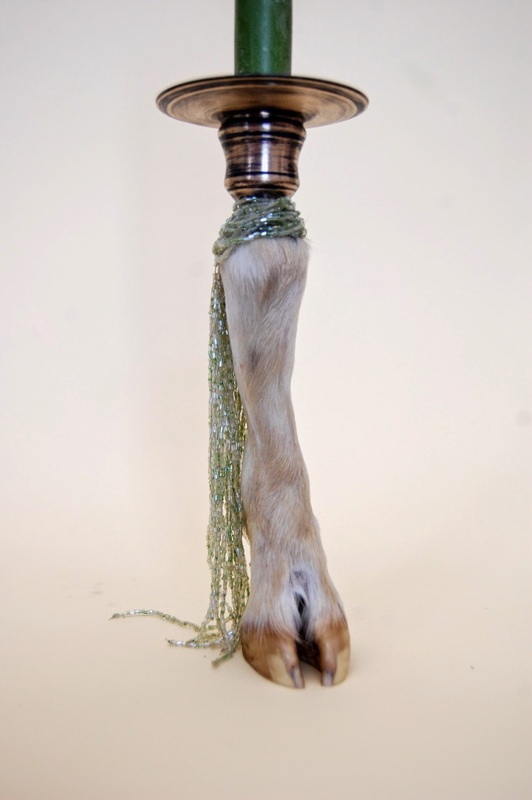 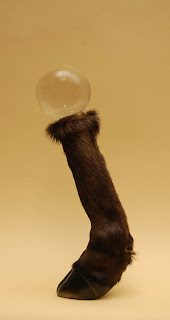 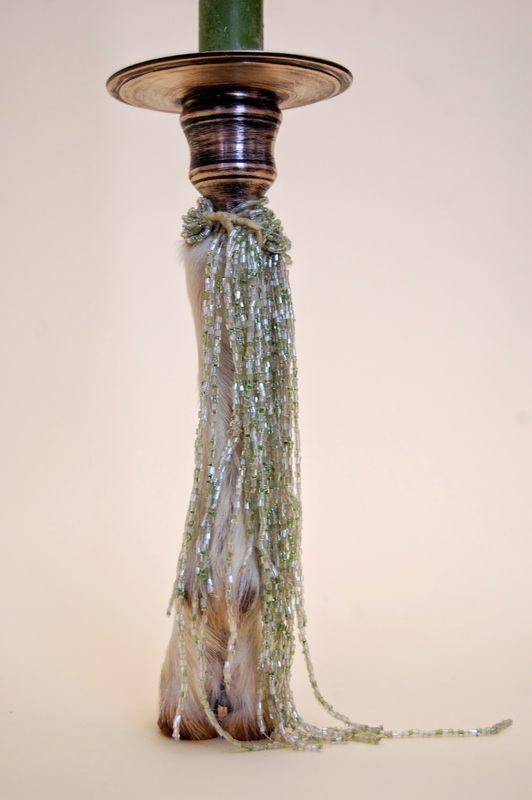 Here are some photos of a pair of deer hoof candle holders I finished and shot today. 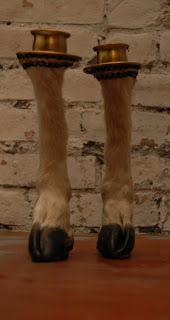 The deer was harvested by a hunter who is using all the venison and passed the hide onto be soft tanned to make a rug. 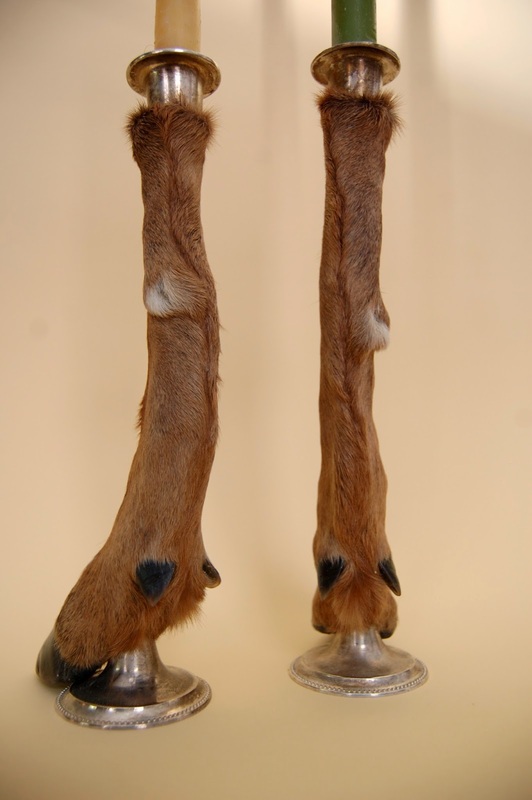 The legs are a nice by product I was happy to collect. 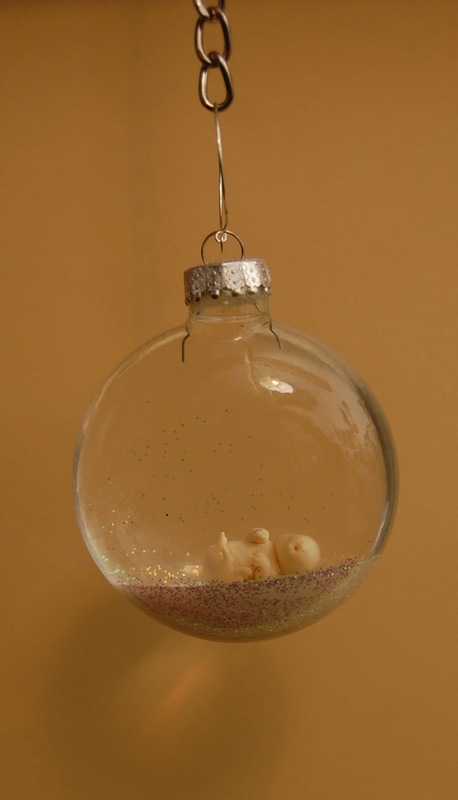 I will be listing these on my etsy page shortly so if they strike your fancy, claim them! 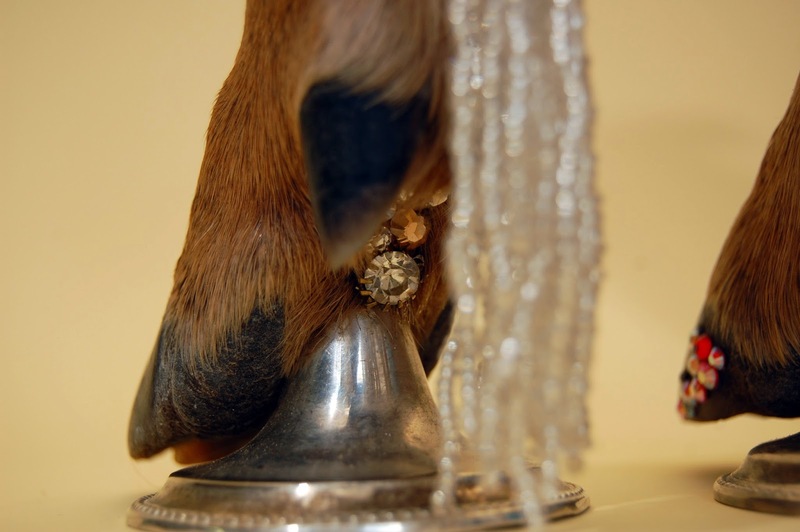 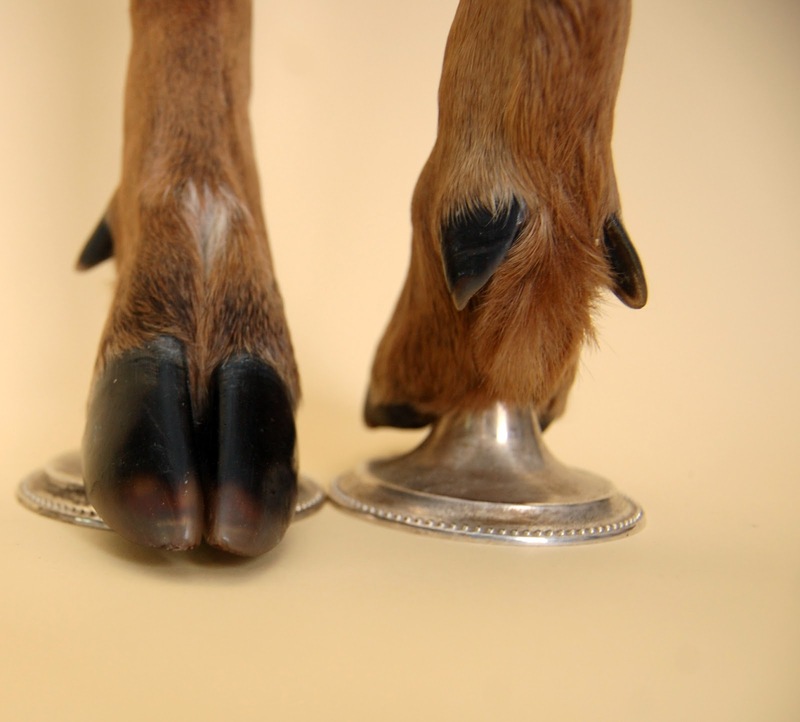 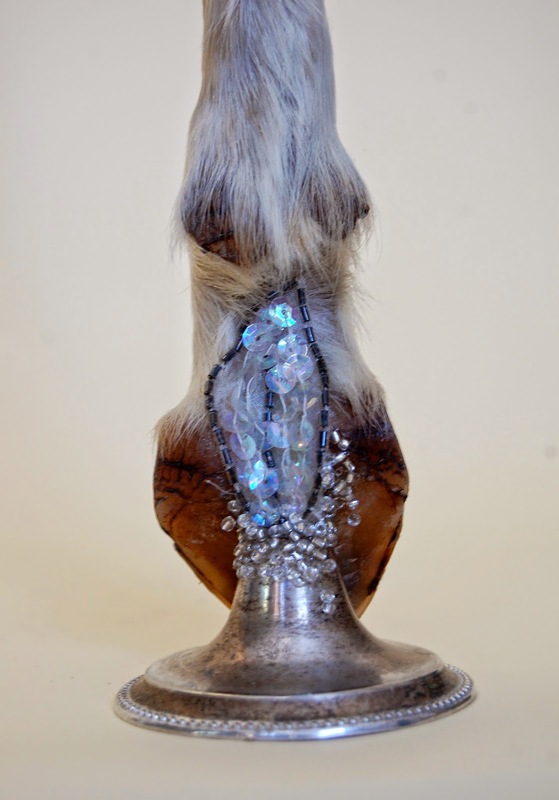 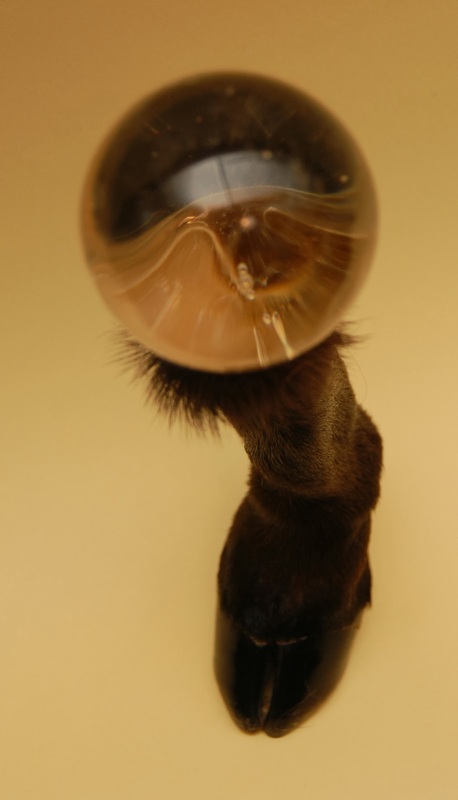 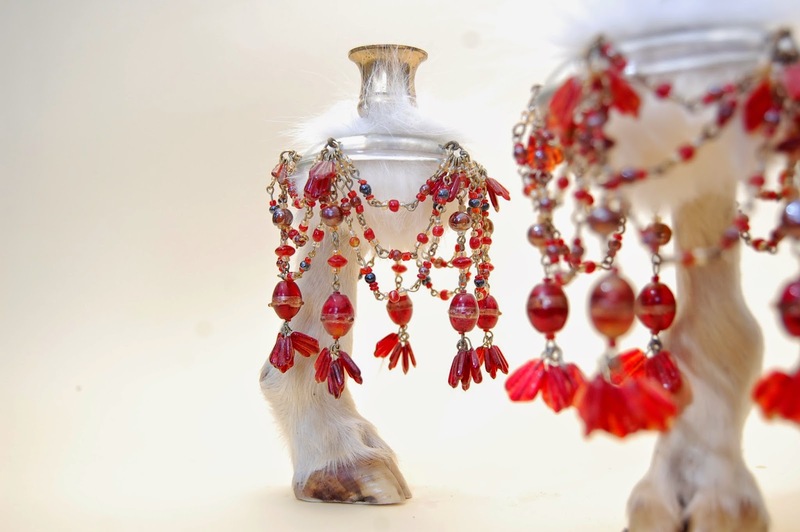 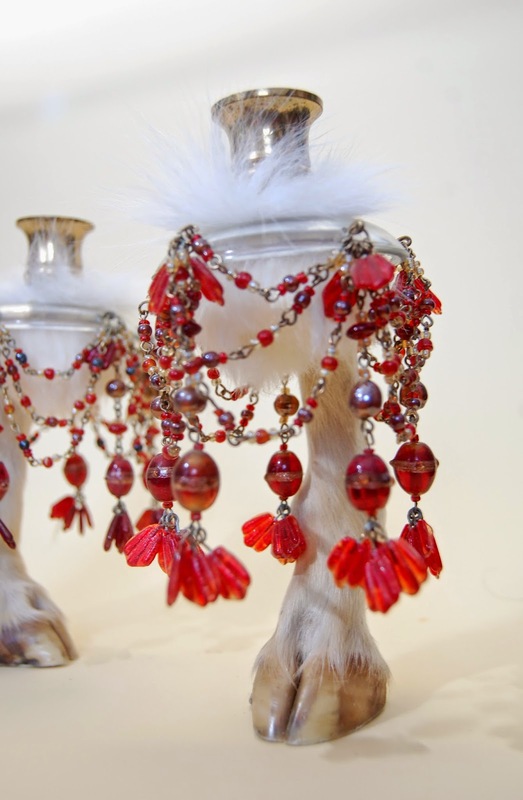 The bases and candle cups are from an antique silver set; this design is a diversion from previous candle holders in which the hooves themselves served as the base and allows the foot to point in a more elongated ans elegant fashion. 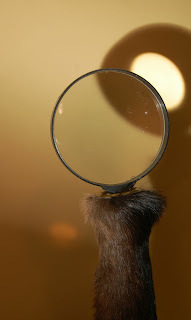 Do I sound like an infomercial? I apologise, I swear my passion for this piece is genuine. 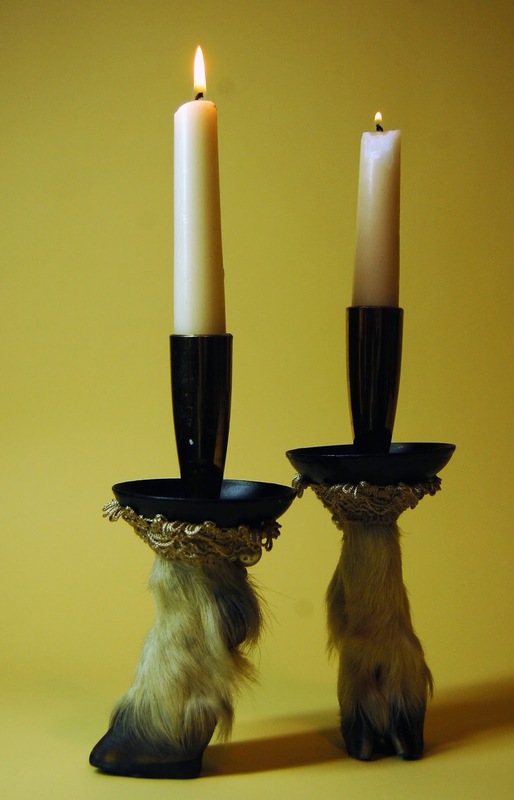 They're also taller than any of my other candle holders sets which makes them ideal for a more formal table setting. 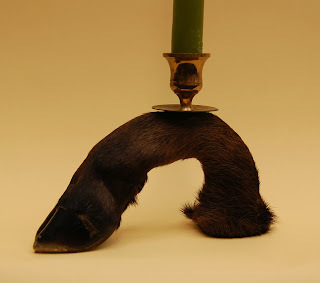 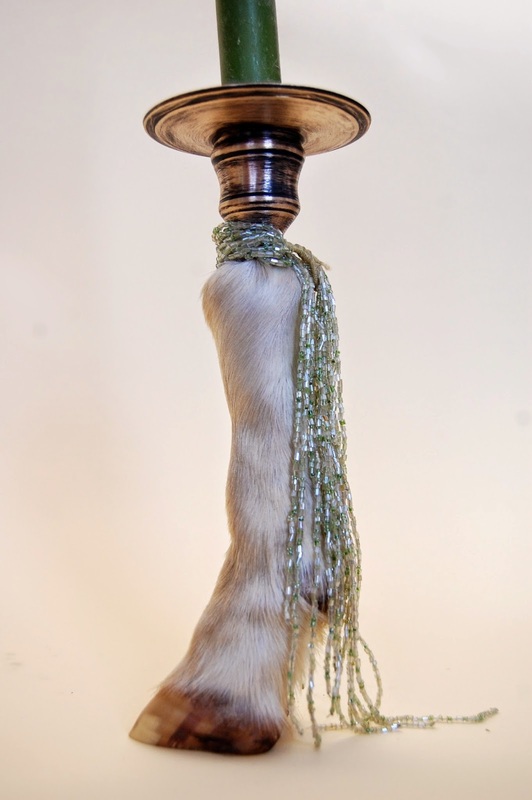 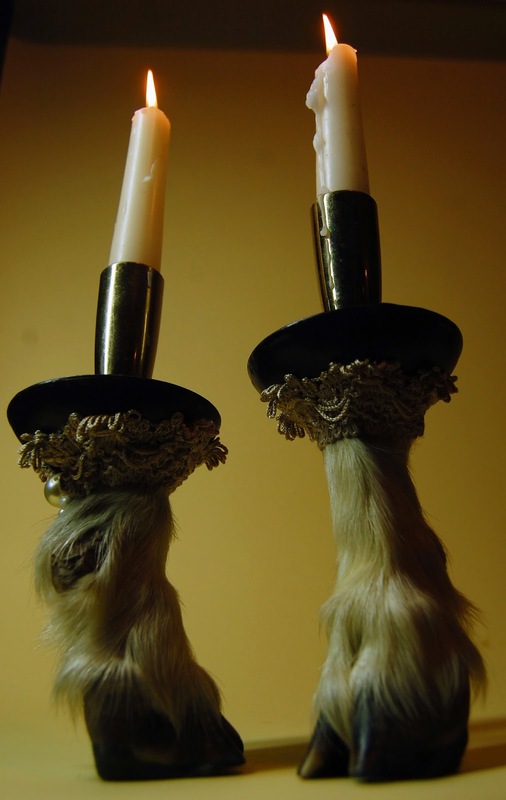 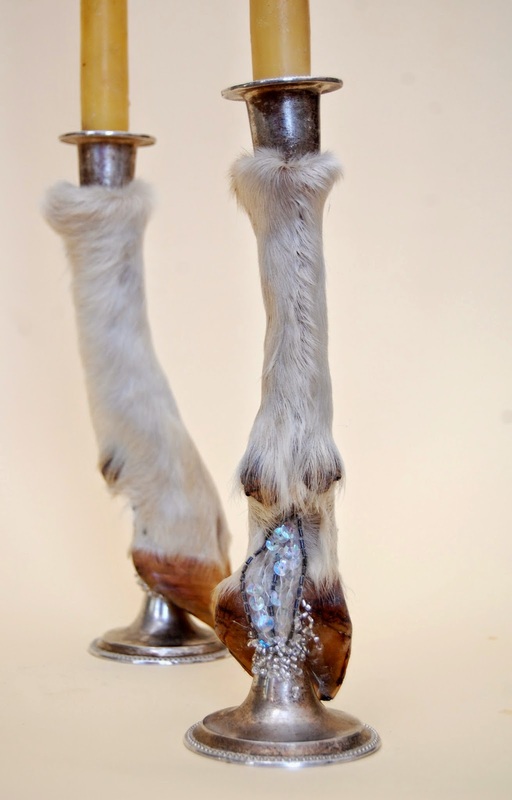 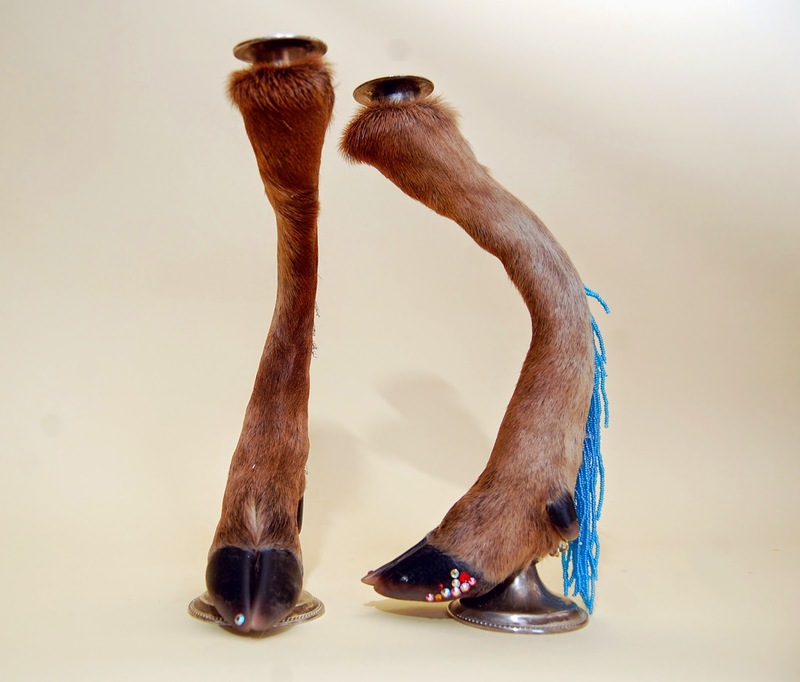 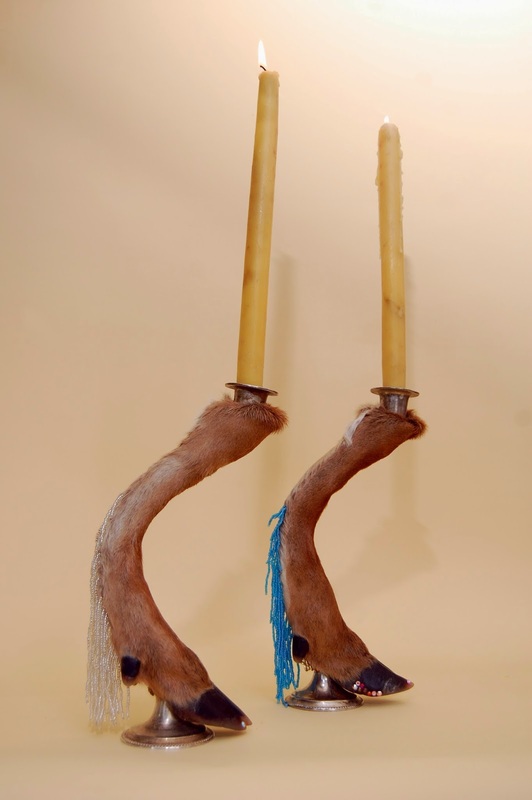 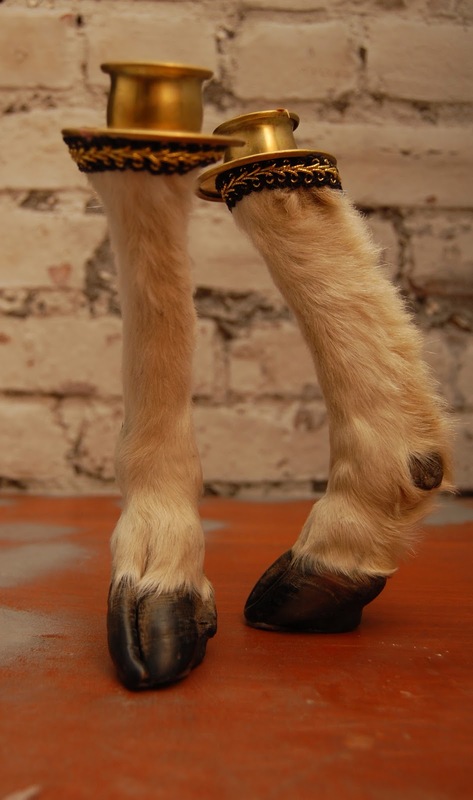 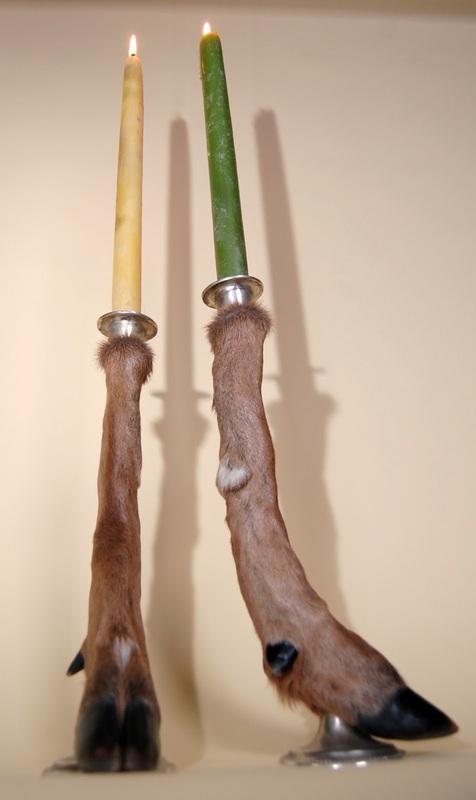 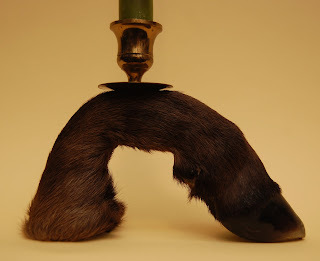 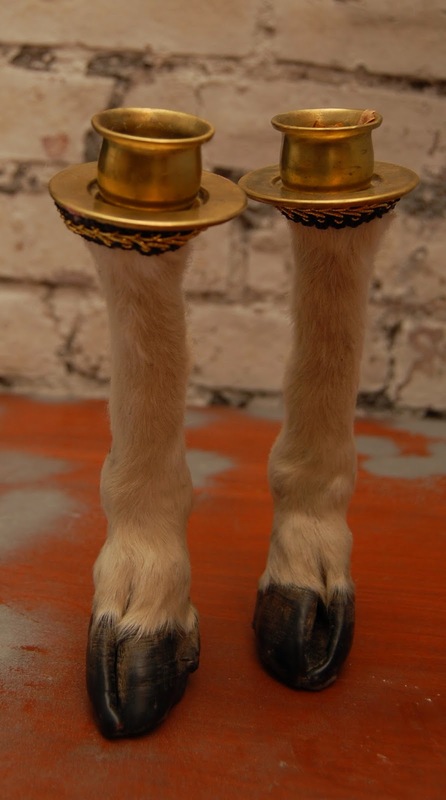 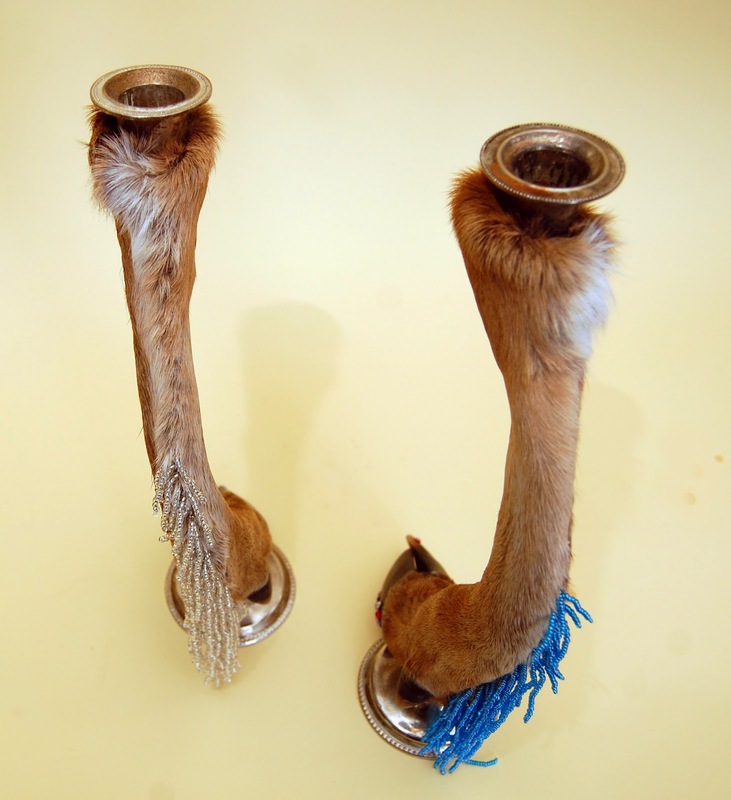 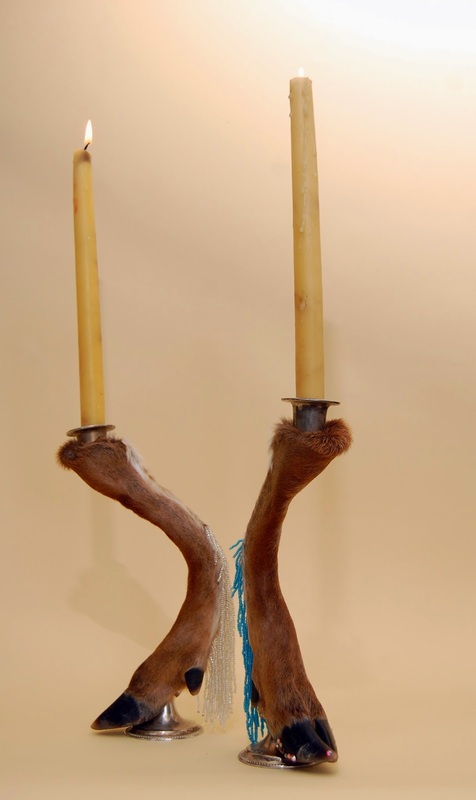 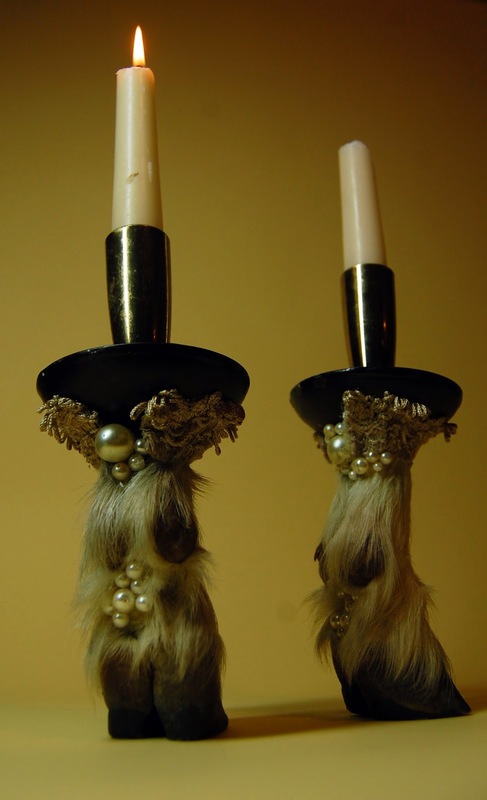 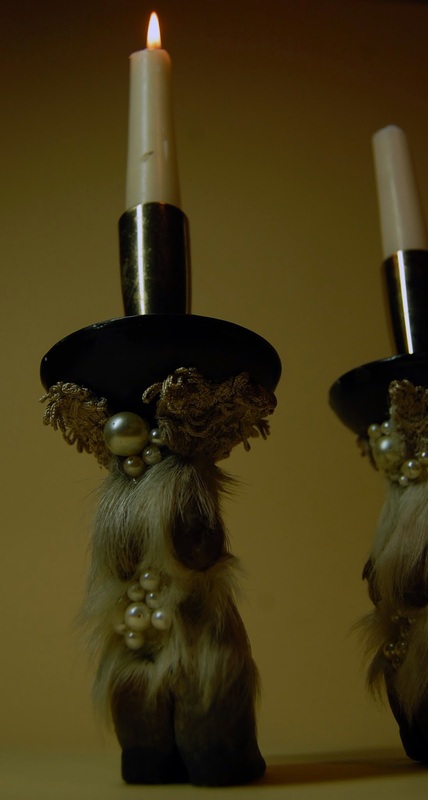 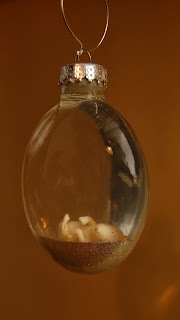 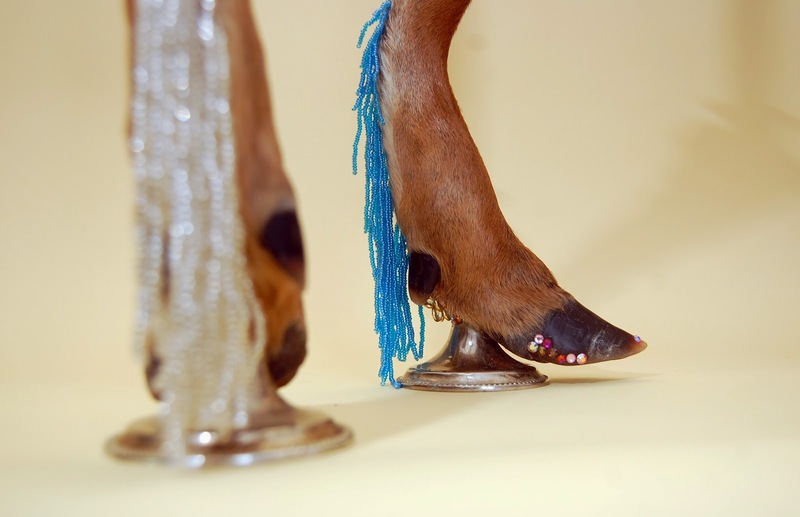 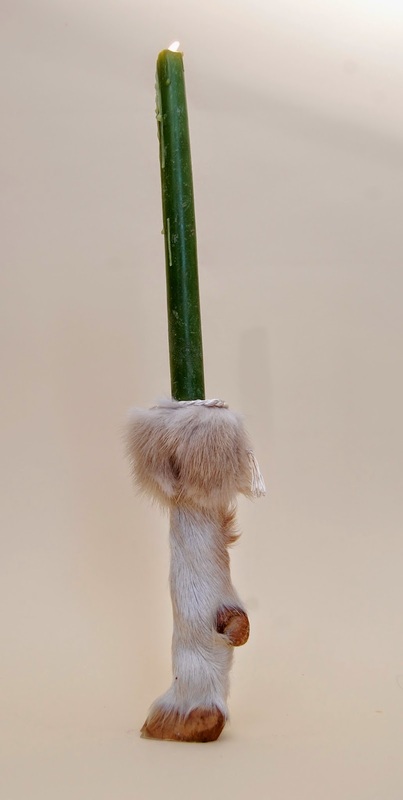 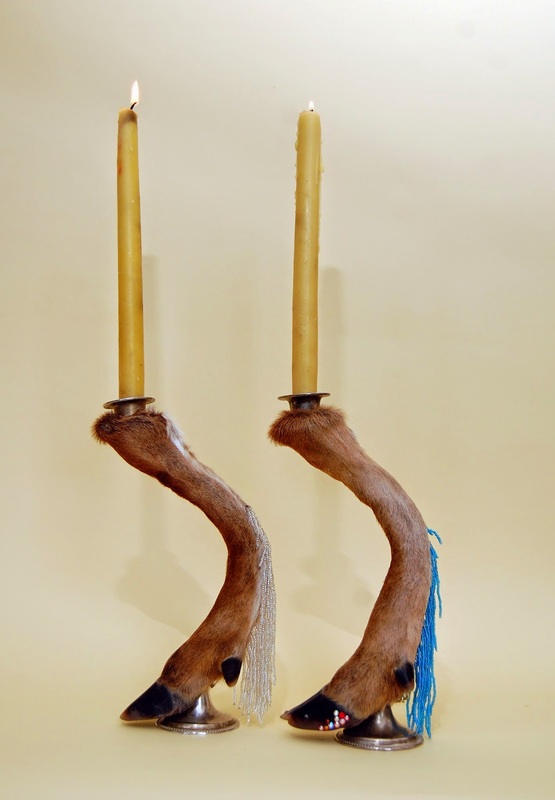 Here is a pair of goat hoof candle holders I made about a year ago; they're one of the first pairs I constructed, and I consider them prototypes in a way. 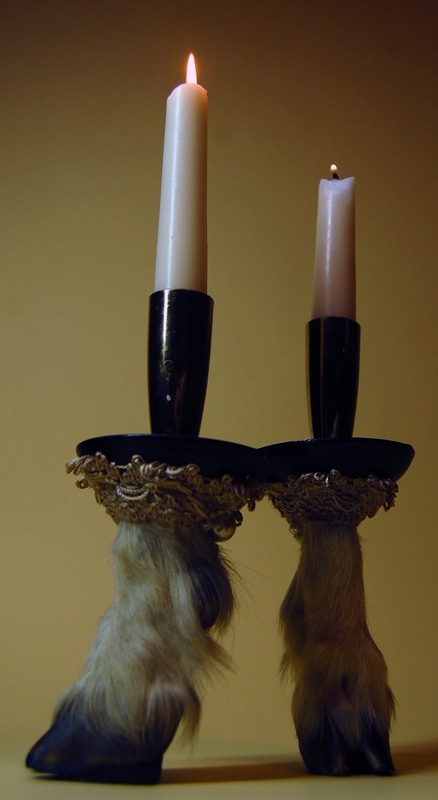 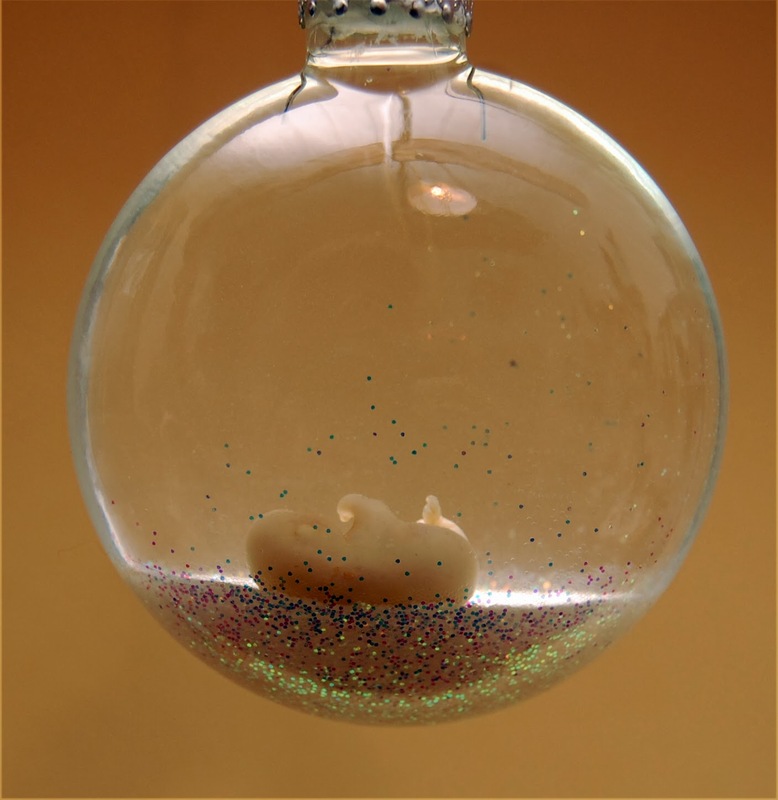 You can see they have a slightly awkward standing angle and require museum wax to safely hold a candle and remain in grounded to the table. 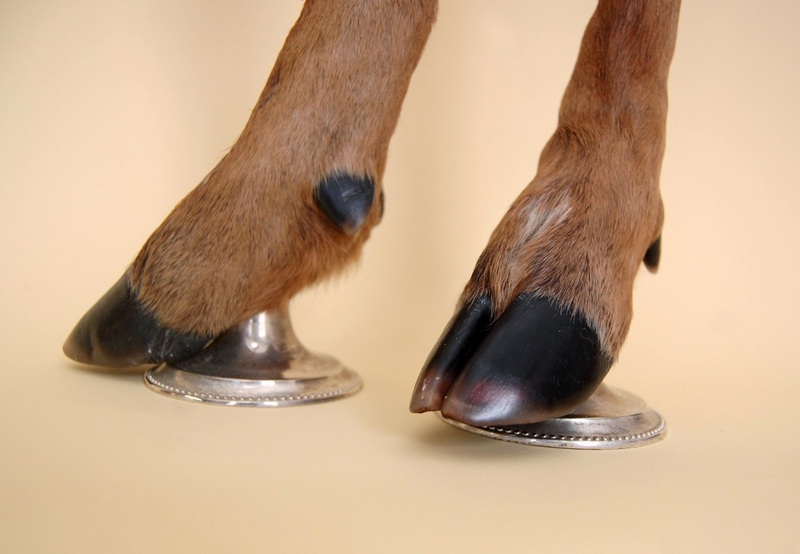 I have since then developed new techniques in how I mount the hooves to rectify this. 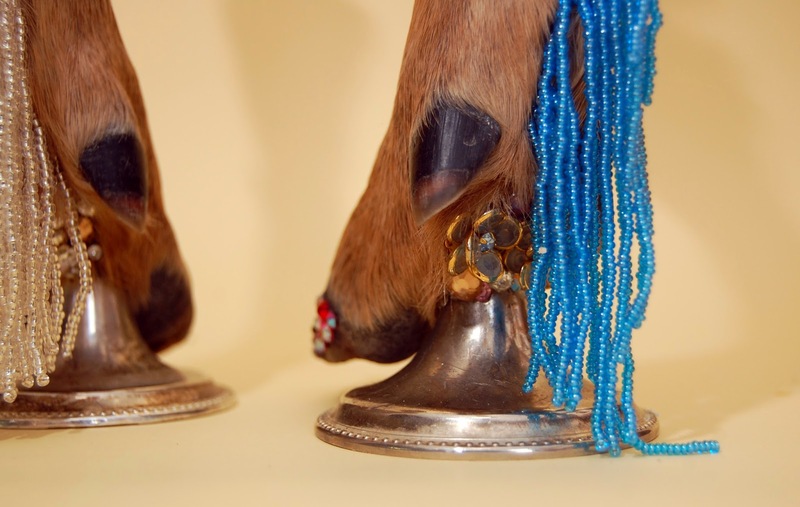 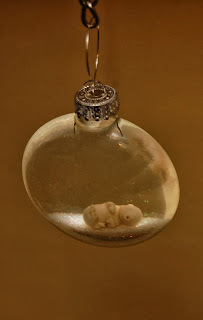 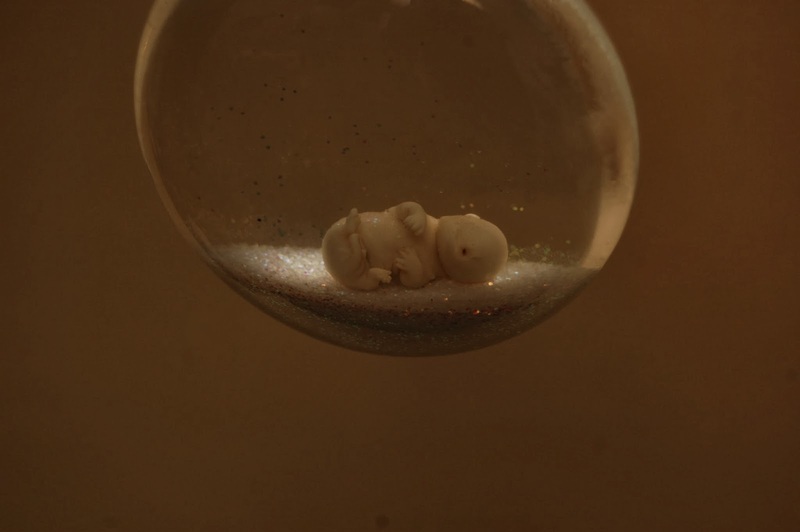 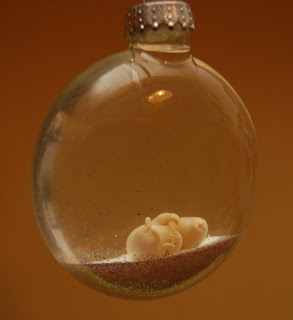 They have recently come back to me after being part of a several months long exhibit at the Ward Museum in Maryland, and have also shown at Art in the Age of Mechanical Reproduction. 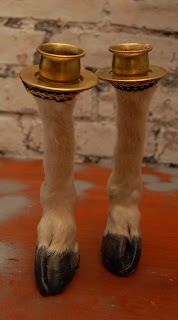 I just now got around to photographing them. 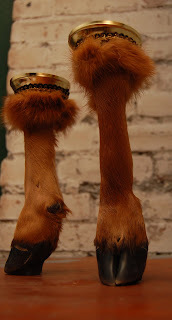 I don't have much else to say other then they are for sale, and I am have about four other pairs in the works.